← 47% of recent graduates in non-graduate jobs – really..? More graduates employed: increased from 73.6% to 75.6% year-on-year. Drop in further study as graduates take advantage of improving employment conditions: fell from 13% to 12.4% year-on-year. More graduates in professional and managerial work: increased from 64.9% to 66.3%. Smaller proportion of graduates in non-professional jobs: for example, graduates working as retail, catering, waiting and bar staff fell from 13.7% to 13%. Mature graduates doing particularly well: a higher proportion (77.2%) were in professional and managerial work compared to all first degree graduates (66.3%). 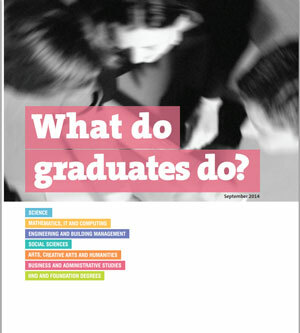 The full document can be downloaded from the Higher Education Careers Service Unit (HECSU) website at http://www.hecsu.ac.uk/assets/assets/documents/wdgd_september_2014.pdf. This entry was posted in Graduate Labour Market Updates and tagged graduate market, What Do Graduates Do. Bookmark the permalink.